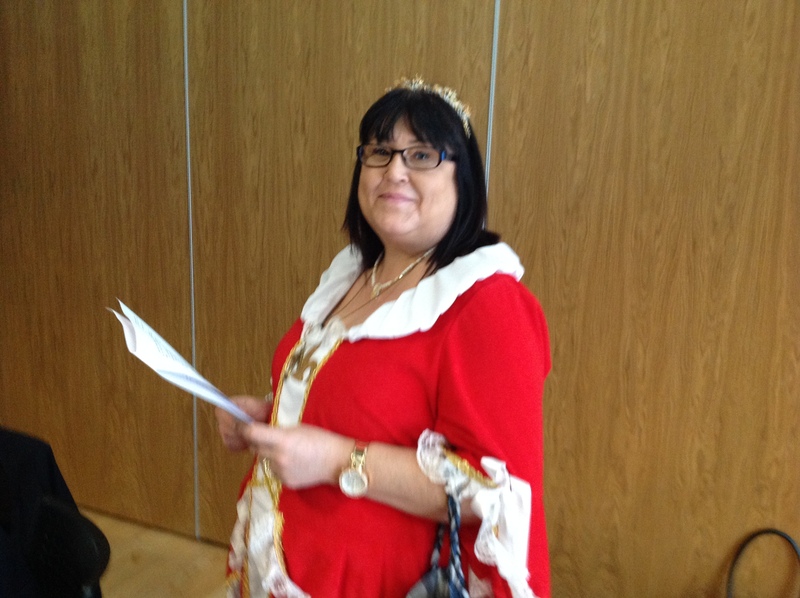 World Book Day – What A Blast! Seriously, I have just experienced one of the best days of my life as an author. I was lucky enough to be invited to spend the day with the pupils of Immingham’s Oasis Academy, and what a blast I’ve had. In honour of ‘World Book Day’, the school organised not just a day, but a whole literacy week to ensure that the academy was able to utilise this event as much as possible. This included class discussions and debates, role play and drama. 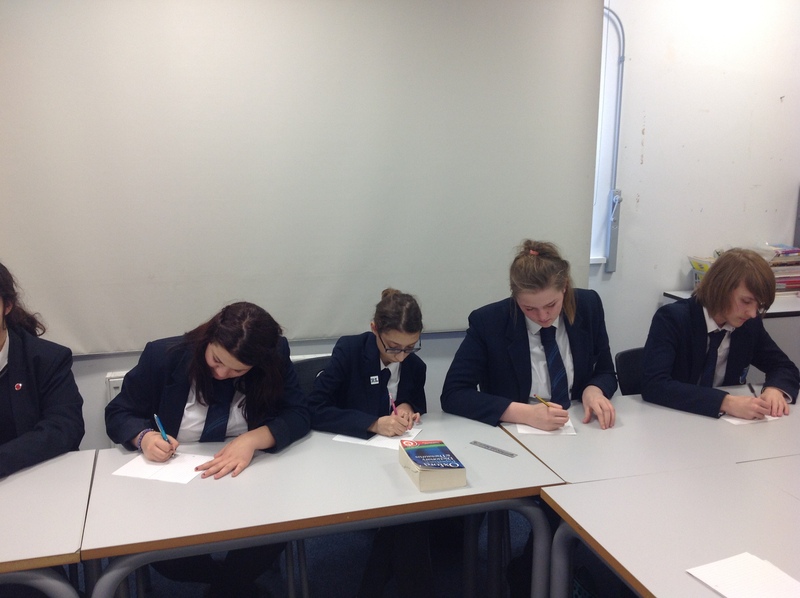 The pupils were also encouraged to participate in thinking skills activities and were lucky enough to have ‘no pen’ lessons where the emphasis was on reading. By Tuesday the pupils had a whole period to ‘drop everything and read’ which included the admin staff and pastoral team. This was done in their tutor groups and reading material was set out for everyone. Some teachers played an audio story whilst others read out short stories and then discussed their favourite books and authors. 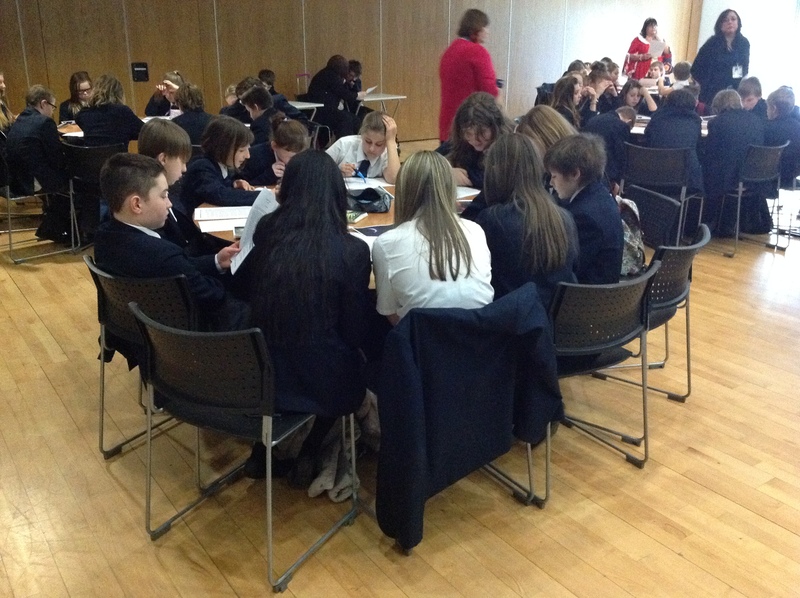 Pupils were offered the chance to read to their classmates and any other volunteers were made welcome. Wednesday was a ‘Rolling Story’ day and for ten minutes of every lesson the teacher read out part of the story of ‘Lamb to the Slaughter’ by Roald Dahl. 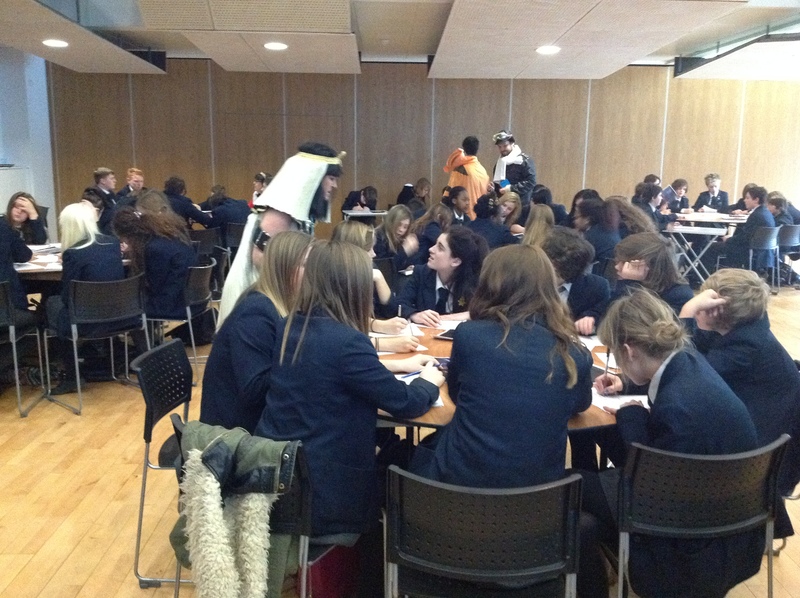 (I actually overheard quite a few pupils discussing the rolling story and how much they enjoyed it). Today was my turn to get involved with World Book Day and after being made extremely welcome (as always) I joined the assembly to hear what the day would entail. As soon as I stepped into the hall, I noticed there was either a book or a book voucher on every chair and there was one for each pupil. Everyone was allowed to take their gifts home which I thought was a marvellous idea. I couldn’t help but notice that every member of staff was dressed up in a character from a book and I loved the person dressed as Mr Tickle! 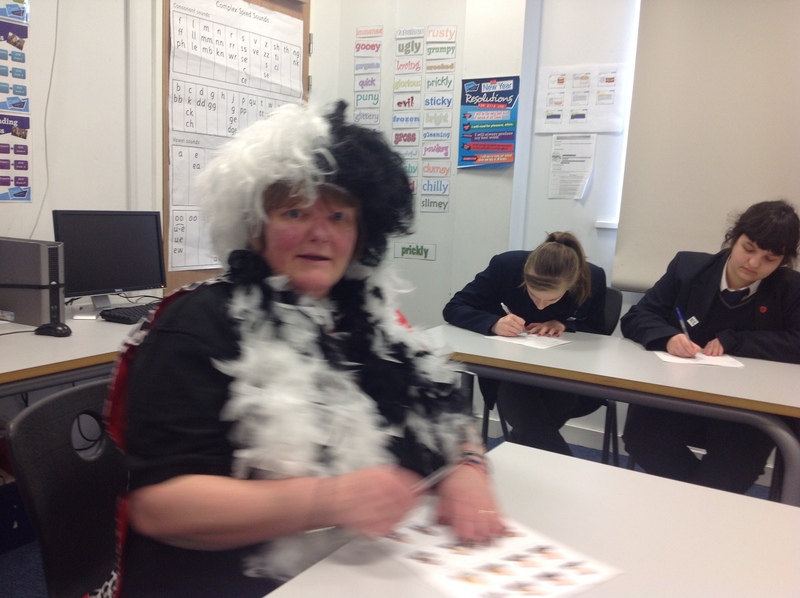 Then Sally Broadly, who is both SENCO and Assistant Principal, (and dressed as Cruella Deville and accompanied by her favourite puppy, Dipstick A.K.A. Lorraine Glover) started the day by showing a few tantalising trailers of great movies which had been adapted from a book. When the trailers finished, Sally asked the assembly who would like to read the actual book and the person who put up their hand first, got a copy to read. Wonderful! What I would like to know is why didn’t my teacher ever do anything that amazing when I was at school? 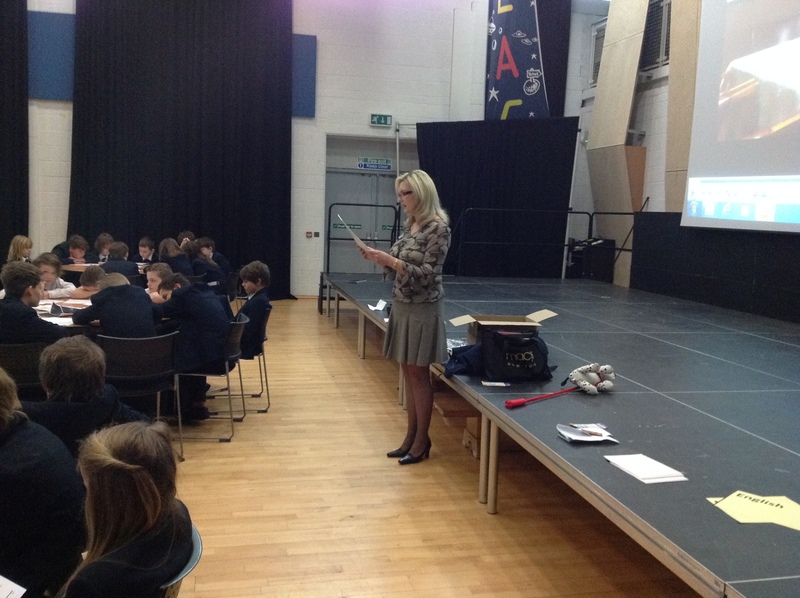 Once the assembly was over it was time for me to meet the Year 7’s for their creative writing class. Once everyone was welcomed into the hall, I gave out a picture of a clearing with a wooden hut in the centre, surrounded by trees, stars and a slither of moon. I then explained how authors sometimes use pictures to give themselves inspiration. In my own book this picture inspired me to write a whole chapter and I wanted to show the pupils how I had achieved this. I brought along with me an excerpt from my first book Sinners of Magic and I was even lucky enough to have three teachers read it out so that I could show how I changed a picture into words. For me, listening to the teachers read out my work was a very poignant moment. It proved how far I had come as an author and I was quite proud of myself. Once the teachers had finished reading the excerpt I then asked the pupils to look at the same image and write what they saw in the picture in their own words. I was amazed at the response and most of the children were keen to get involved and later, to show me what they had written. After twenty minutes I then gave the pupils another prompt which was of a character and asked them to add this to their story. Not all the pictures were the same but they were mostly of dragons, wolves or elves. I explained they could either use the character I had given them or choose one of their own, after all, it was their very own story and they were in charge. The lesson turned out to be a great success and one which I enjoyed immensely. The pupils continued to ask me to read their stories and three pupils actually approached me after the lesson and said I had inspired them to write, which as I am sure you can imagine, was music to my ears. Without a doubt, as an author, to know I have inspired any young person to write is incredible. 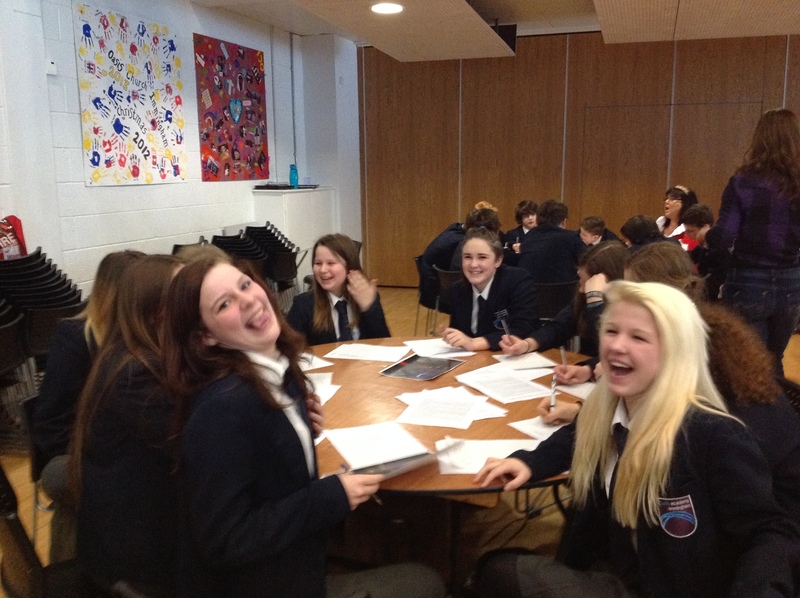 Once I met the Year 8’s who were just as enthusiastic, it was time to meet the gifted and talented group. This time I decided to do something completely different. I gave them two characters which were Edward Cullen and Homer Simpson and I asked them to write down what made them so different? Again I offered for the pupils to choose their own if they wished and we had a very amusing afternoon looking at how differently people perceive certain characters. We then wrote a conversation with the same two people meeting for the very first time which was very funny and for some characters rather fatal. All too soon it was time for me to go home. I have to admit at this point that I’m not entirely sure who had the most fun but when I was stopped outside the school gates by a student who said to me, ‘I’ve read all J. K. Rowling’s books and yours are way better’, well, apart from wanting to kiss him I think I actually skipped to my car. Although I wish to be seen as an author in my own right. The fact that this young man wanted to say what he considered to be a compliment to me, really touched my heart. The truth is I got a lot of pleasure from teaching the kids and being around them today. They really are a great bunch! Thank you Sally for inviting me to your school and I look forward to hopefully joining you all in the near future. Happy ‘World Book Day’ everyone, it really was a blast! !